Allan Nykjær Pedersen, Chief Operating Officer of Lotek A/S with a HeartSine AED. Passengers and employees of DSB, the largest train operating company in both Denmark and Scandinavia, will now be protected in the event of a Sudden Cardiac Arrest (SCA), a life-threatening condition in which the heart suddenly and unexpectedly stops beating. Although there are defibrillators in trains across Europe, the installation of these AEDs on DSB trains is the first in Europe that meets all the stringent safety requirements contained in new European safety regulations. 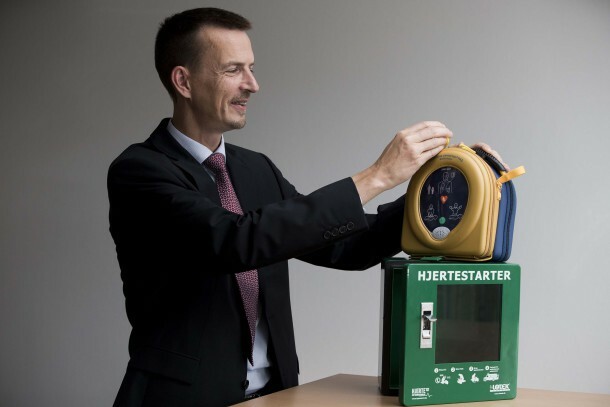 The AEDs were sold and installed by Lotek A/S, HeartSine’s Authorized Distributor in Denmark. Of the 520 AEDs that were sold, the first 202 are in place, with plans to install the remaining lifesaving devices in the coming months. For our Danish speaking visitors, you can read the full news feature by clicking here.